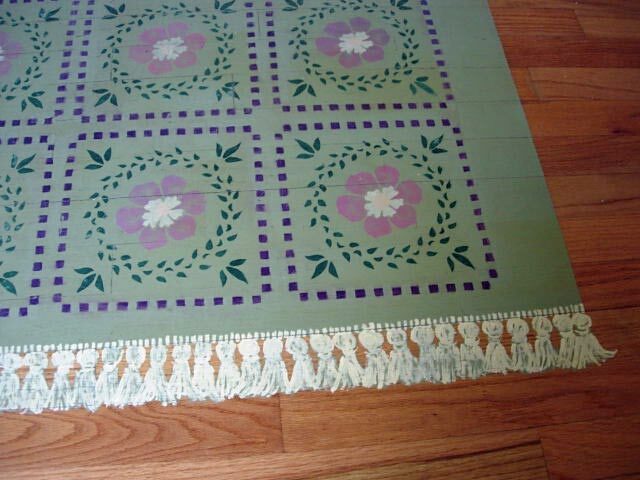 I painted this rug on my mudroom floor about 14 years ago. I call it my antique rug nowadays as as it is getting a little shabby. The hardwood floor in this room is going to be re -done soon and the rug will have to be sanded off for refinishing. I will miss it, but I am eager for the look of darker hardwood – all shiny and new. 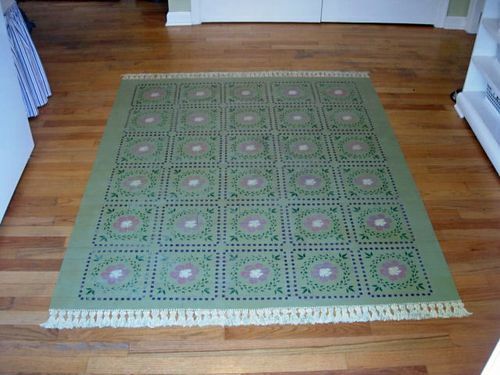 I previously painted a rug on a friend’s porch as a project for my book, Instant Decorating. When we moved into this house, I didn’t want a rug in this room because it would just get in the way. There are three exit doors and it would have been a hazard with people and little kids in and out all the time, so I decided a painted rug would be a good alternative. Most friends and family come through our garage and into this room when coming to visit. Many of them have actually wiped their feet on it, myself included. It does look real, even though there are no shadows painted on as you would see in a trompe l’oeil painting. It is always a topic of conversation when somebody new comes to visit. When we moved into our house the hardwood floor on the first floor was laid uneven and the hardwood manufacturer came to re-do it. The workman came and sanded the floor during the day, leaving the floor bare until the next day when they were coming back to put the polyurethane on it. I stayed up all night and painted the rug so when they came the next morning , they could poly right over it, saving me a step. The stencil is is just a repeat of the same block of little squares, a circle of leaves, a flower, and the center of the flower. I used 5 different colors of craft paint and latex eggshell for the base color(green). I drew the bound edge and tassels free-hand with craft paint and a fine-tipped brush. I have created a pdf. 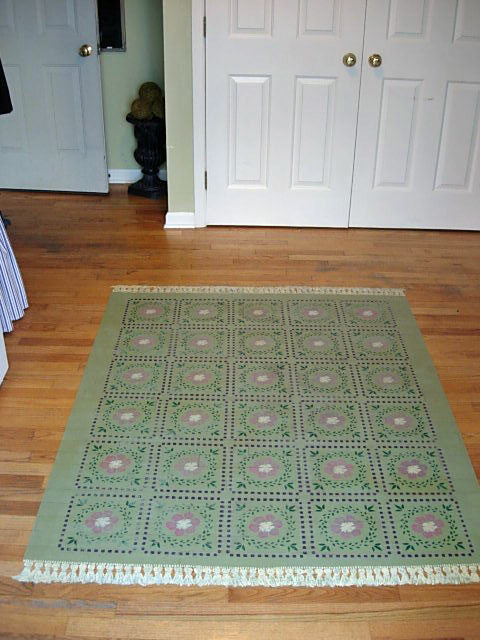 for you of the actual design and tassels to paint a rug on your floor, as well as the instructions from the pages of my book for you to download and print out. Please help! I painted my dining floor with a quality Sherwin Williams paint (not floor paint), I then stenciled a flowering vine border design with craft acrylics. Then I painted a rug on the floor to look like it is our stained glass reflecting on to the floor. Using oil-based polyurethane will turn your painted floor yellow. You need to use water-based polyurethane. It will not turn you floor yellow. Most major brands of poly make one. Minwax Polycrylicand Varathane are two that I know of. Another is Zinseer Bulls Eye Ultimate Polyurethane. Zinseer also makes another water-based poly that comes in a blue can. I think it is just called Polyurethane – Water based. Any major brand of poly that makes a water-based product is what you want to use. Follow the directions on the can’s label and your floor will look great for years. I just now found this…….. I LOVE IT!!!! I sort of, maybe, might be able to dab the paint on if I had the spray adhesive and all the paint colors…… but how in the world did you cut that stencil out without cutting off a finger or sliding through the stencil and ruin the sheet?? You are definitely the best. I accidentally found this on my search for the starburst mirror you made out of shims and a necklace. I have forgotten some details and hope I can figure out how many shims and size to buy. I bought a square mirror (candle holder) from Dollar Tree and was so hoping to finally get around to making one like yours. love the tassels.. they look so real and must have taken hours – but definitely worth it! Could you show us how to do that? Hi Christine. 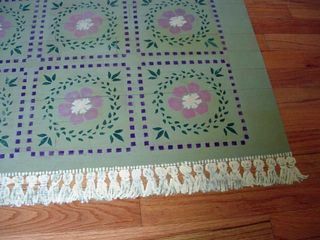 I can definitely do a post as i have been wanting to make a new rug. It is not hard to make the tassels at all as it is just a basic shape and rounded lines. You could practice drawing them with a pencil and paper to get the hang of it then do it with paint and a brush. To make them look realistic overlap a few, have some skewed, others more straight. I will get a tute up as soon as I can for you. the rug looks great. but most ppl cant do anything nearly that good. i was looking for a painted faux rug for dummies kind of project. i think for most ppl who dont have much artistic talent, this project is impossible-or wd look very baaaad. I’ve been meaning to paint a rug on my patio but I needed a step-by-step. Thank you SO much! Beyond clever – ha, ha – you wipe your feet on it. wow, it looked like a real rug, i had to really look. Awesome Job! Oh, wonderful! I so wish I could just paint the plywood underneath the carpet in the bedrooms! Great job – you are so creative ! Fantastic job! I thought it was real too. It does look pretty real. Even knowing it is fake, I have come in to the house and have wiped my feet on it. I laugh at myself everytime I do it. that is unbelievable! i had to go back up to the top to fifure out what in the world you were talking abot. at first i really thought i was looking at a real rug! This is stunning! I would have never known just by looking at the photos that it wasn’t real…what a terrific job you did! That’s pretty cool. The dog wouldn’t slide that halfway across the room during her nightly wild time! Great getting comments from all of you. This did take a bit of guts, but I did do it previously at a friends house, so I had confidence I would like it. Try it in a bathroom or a small room for starters, if you are happy with your results you can take on a bigger floor. WOW! You did such a good job on that! 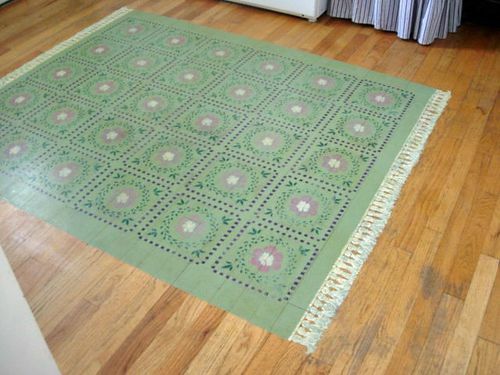 We are installing hardwood floor in our house this spring, and I wanted to put a rug under our dining table, but I couldn’t find one that would be the right size for the space. I had thought about painting a rug on the floor, but I am a little afraid to. I know it wouldn’t turn out as nice as yours, and I probably wouldn’t be able to do anything as intricate, but I may have to give it a try. I LOVE yours! Hope you have a great day! Beth. Stopping by from SITS! I can’t believe it is not a real rug. Very cool! I bet it’ll be sad to see it go! That looks great! I never thought of doing anything like that before, although unfortunately we need real rugs being on the second floor! Very interesting and amusing subject. I read with great pleasure….. I agree – it totally looks real – you are very talented and crafty. (From someone who couldn’t be crafty to save her life). I thought it was real, too! This is just amazing. At first I thought you were joking. It is just beautiful. Thnaks for the comments. Don’t be afraid to do it, you can always paint over it if you are unhappy with your efforts, or in the case of your steps, re-carpet. I think doing something on your stairs would be great and easier, as you can do one step at a time. The real key to making it last is a few coats of polyurethane. Go for it!! You have been holding out on me. I love this and almost did a huge one in my Dining room, But more of an outline with some details. But toally chickened out. We have since ripped up the carpet on our stairs going to the basement and they are pretty ruff and I am thinking of painting them and doing something simalar. Thanks for sharing and hopefully giving me the guts to try this. You inspire me.